Bridge Club Sri Lanka has taken a decision to gather all the members scattered around the country to make the club stronger and to achieve its goals through the unity and team work. The revival meeting of BCSL which was held on 05/12/2010 was the initial step of the project. BCSL has formed a facebook group and were able to join around 60 members to the group. The members who became members were posted and updated about each and every event which was taken place throughout the year. The mission project 2011, PA selection 2011, JA Training, 13th Anniversary of Bridge Club Sri Lanka, 23rd APCC, Welcome Mutasan, and all the meetings were the major events taken place before the month of November 2011. Club decided to post letters to everyone until we get a response from each and every member about their updated contact details though it cost. The decision was successful to a certain extend and the members of the facebook group were increased up to 80. 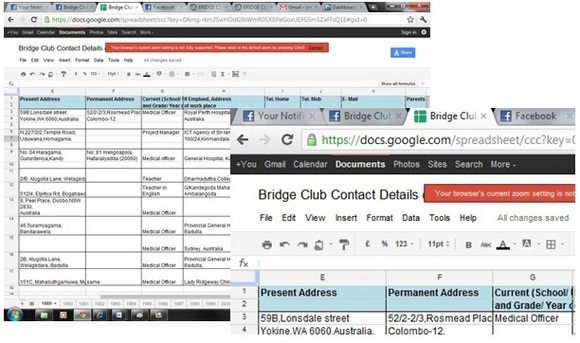 At the mean time a google doc was published and posted through the fb group to inform members to update their own contact details by their own. The past PA reunion was held at Inter Continental Hotel Colombo with the presence of former members of the club became a very decisive meeting which decides the future direction of the well known Bridge Club Sri Lanka. The vice president of the club Lakmal Muthugama was assigned for the task of updating the database with the Senior Advisory Panel member Ahshan Ali as the advisor. The task’s deadline was 15th December and due to an unavoidable circumstance the target was unable to fulfill. But, by the last week of December they called to each and every member of the club to the existing contact details with the support of other club members. An update of the work was published through facebook and emails. The report said that the many of the existing member details were not accurate and the finding of the members should be accelerated with the situation. Again the Lakmal and Ahshan got the initiative to handle updating. The members without contact details were listed and started to find out it through the other JAs. When it was succeeding, the number of members abroad was seemed to be increased and another list was created regarding the members abroad. The mission of finding members became a success day by day. Many members were networked through the project and it reflected the well famous project of everyday ambassadors. The regional details document also published during the end of December and it showed the details of members with their districts and helped to identify the regions to held regional meetings. By that the club itself has identified two regions Colombo and Kandy. 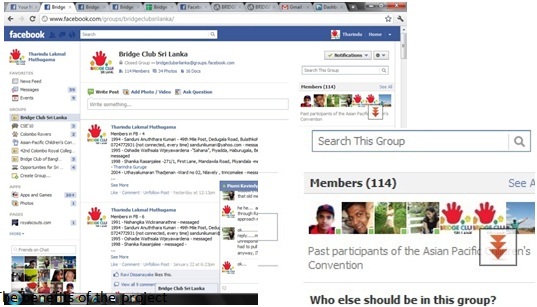 Through existing details, facebook, emails, telephone calls, through members, through friends, and through friends of friends the Bridge Club Sri Lanka was able to collect 175 details out of 188 by the 2nd week of January and our Facebook group was increased to 113 members. 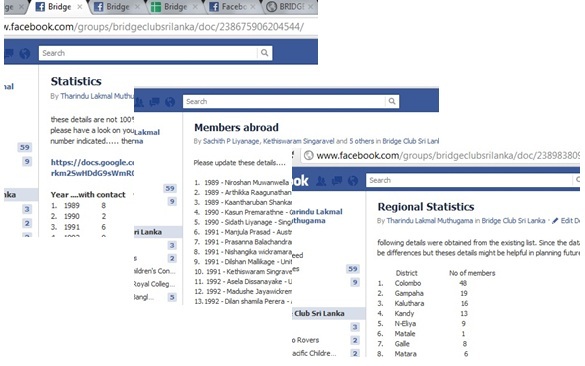 According to the Niroshan Muwanwella the founder treasurer of the club this was the massive project the Bridge Club Sri Lanka has ever done with the participation of many Bridge Club Sri Lanka members. Still we have to update 13 members where only 6 members were out of the current coverage and the rest is pending at the moment. 25 members updated as members abroad and it is considered and maintained in a separate list for the convenience of informing. The member updates showed us their professions and BCSL was able to identify its strength since many professionally excelled members are present. The resource personnel of the club were identified with their fields. The BCSL is trying to finish the updating before the end of 2nd week of February. Step by step with the effort and support of each and every BRIDGE we are achieving our network of heart to heart.